The World Academy of Sport (WAoS) has launched a new global Physical Education/Sport Teacher Training Centre in partnership with the UK’s University of Worcester, to deliver inclusive education around the world. WAoS is already a global leader in providing certified training solutions to the sports industry. For example, its Athlete Friendly Education Centres support student-athletes in combining both their sporting and academic careers. The University of Worcester, one of the largest and best UK universities for teacher education, has long championed inclusive education. In recent years, Worcester’s work has won a global reputation with active partnerships in China, Japan, Turkey, the United States and Europe. Meanwhile, Worcester students, staff and graduates have participated as Paralympians at the Games in Beijing, London and Rio de Janeiro. In 2015, Worcester became the first university to host the European Wheelchair Basketball Championships. The finals were played at the University of Worcester Arena, the UK’s first indoor arena purpose-designed to include the wheelchair athlete. One of the first programmes to be developed will be with the IPC Academy, the global educational division of the IPC. “Assisting in the creation of inclusive school environments is critical for the IPC, not only through infrastructure, but also by providing professional development opportunities that explore ways for a school environment to be more inclusive when it comes to sport,” said IPC Chief Executive, Xavier Gonzalez. 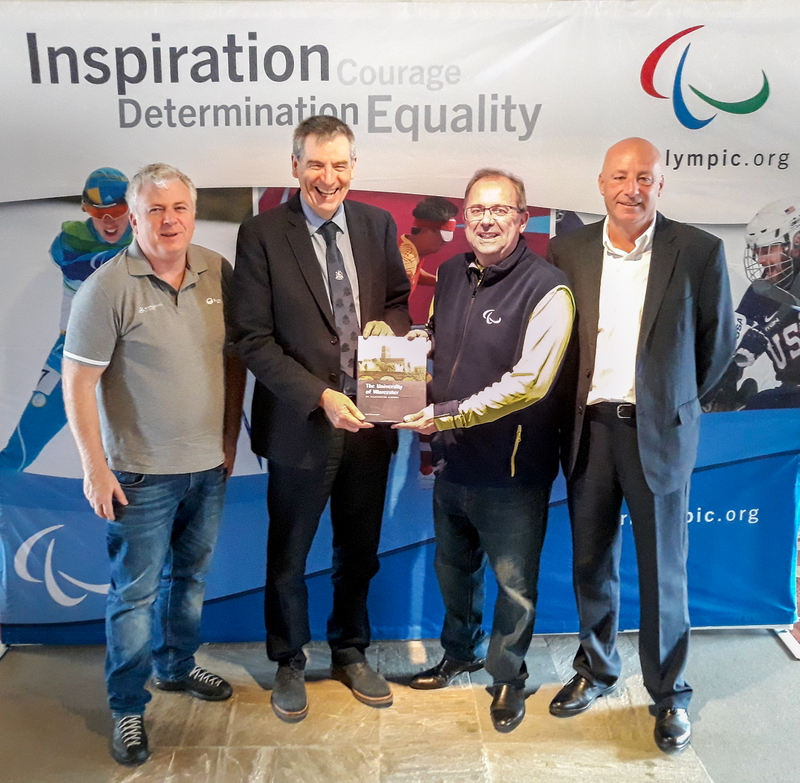 Professor Green and Mick Donovan, Head of Sport and Inclusive Education at Worcester, met with IPC Chief Executive, Xavier Gonzalez, and WAoS Managing Director, Chris Solly, on Thursday, March 15, during the 2018 PyeongChang Paralympic Winter Games, as part of the development process of the Centre. The World Academy of Sport originated in Australia in 2003 and has offices in Melbourne, Manchester, Dublin, Athens, Vancouver and Lausanne with its main office in Manchester, UK. The World Academy of Sport delivers learning programmes for sports and event participants - athletes, managers, administrators, officials and coaches - through a series of tailored educational programmes. For further information visit www.worldacademysport.com. The University of Worcester has earned a reputation as the UK’s most inclusive university, and was shortlisted as The Times Higher Education’s University of the Year 2016 as a result. In 2014, Sir Philip Craven, then President of the International Paralympic Committee, officially opened the University of Worcester Arena, Britain’s first major indoor sports arena specially constructed to meet the needs of wheelchair as well as able bodied athletes. The following year it won the 2015 Guardian University Award for ‘Buildings that Inspire’. The university’s history lies in teacher training and over the years it has combined this expertise with its passion for inclusion to develop innovative practices to educate teachers, sports coaches and other professionals in opening opportunities for all. The IPC Academy is a partnership between the IPC and the World Academy of Sport and is the education division of the IPC. The Academy brings individuals together to improve educational standards of sport throughout the Paralympic Movement and ensures that executives, administrators and officials have an educational centre that is sensitive to their needs and in touch with trends and developments, providing world class programmes. The IPC Academy has a focused team continually enhancing programmes to ensure they remain world leading and specific to the Paralympic family's needs. For further information visit www.ipc-academy.org.